Warehouse Safety Program like Safety Training for Workers. Warehouse safety is top priority for facility managers. It should be top priority for everyone from the floor worker to the warehouse president. Not only should every worker be aware of visible safety hazards and how to counteract them, they should also see potential safety hazards that may result from certain actions or inactions. Even though it may seem like common sense, most workers simply don’t know or don’t pay attention to the hazards of their jobs. Safety trainings are a great way to educate your work force. These trainings can also save you money – in lost hours, medical bills and insurance rates. It’s obvious that if a worker is hurt on the job, he or she loses working hours and incurs medical bills that the company ultimately will have to pay. These unfortunate events will likely be covered under your workman’s compensation insurance or your liability insurance. The more claims you have, the more your insurance rates rise. But did you know that implementing consistent safety programs for warehouse employees can also result in lower insurance rates in the first place? That’s right. Your prevention can result in your savings. Check with your insurance representative to see if you are eligible and what the requirements would be for a safety program to qualify. 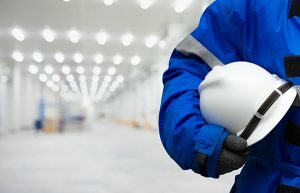 Even a monthly safety tip can have a big impact on your work environment, can raise awareness among your employees and get you a better insurance rate. Here are a few tips to get you started on that safety program. We’ll take you through December of this year, but we’re sure you can look around your environment and think of more for the following year. – Do routine forklift checks. Forklifts are the culprits of one of the highest accident rates in warehousing. Make sure all employees know proper operating procedure. Inspect all forklifts before and after each use. – If you have racking systems, verify and confirm the weight capacities. It is very easy to go over the weight limit, spelling disaster for your rack system, and possibly your workers. – Check the anchors of your upright shelving. Can’t find ‘em? Make sure you have them, first of all! Then check them for grounding. They should provide enough counter-pressure to handle the weight of the product on the shelves. – Keep your work area clean and clear of any debris, sticky floors, wet floors, or dust particles. All of these can be hazardous for workers on foot or on equipment. – Keep all equipment clean, updated and in good repair. Old, failing equipment is the cause of many workplace accidents. Make sure employees know how to handle any mechanical equipment. – Discourage use of electronics while on the job. They are a distraction and are the root of many accidents, simply because someone wasn’t paying attention to the surrounding environment or didn’t look up from the phone. – Do routine ladder checks. Everyone thinks they know how to use a ladder, but reinforcement is always helpful. Make sure ladders are sturdy and balanced and all hinges operable. Make sure employees understand the various capacities of ladders and that only one person at a time should be on the ladder. – Have all equipment installed by a professional. Double-check all installed equipment. Make sure it is securely in place and can handle the planned loads. – Check the area around you before moving any type of equipment – electronically or physically. Make sure the route is clear of both people and things and that you have a clear shot to your destination. Safety programs can help to insure your profitability. Start one today!